2017 has been a foundational year for the Dentsu Aegis Craft Matters programme. The brain child of Jean Lin, DAN Global Exective, CEO of Isbar Global and fhe DAN Executive Sponsor for this program. Craft Matters set out with a simple goal; to bring the collective power and diversity of our network together to create a truly integrated output that is enabled by technology, empowered by an ecosystem and seamlessly connected through design. 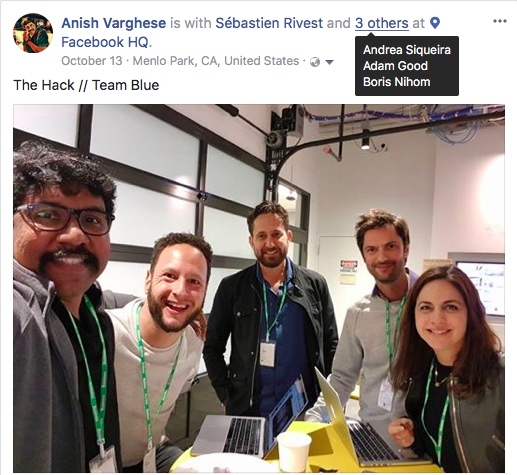 In 2017, the inaugural global DAN Creative Hack in March October in California with some of our clients. The class went on and did five local hacks including the one in Singapore. 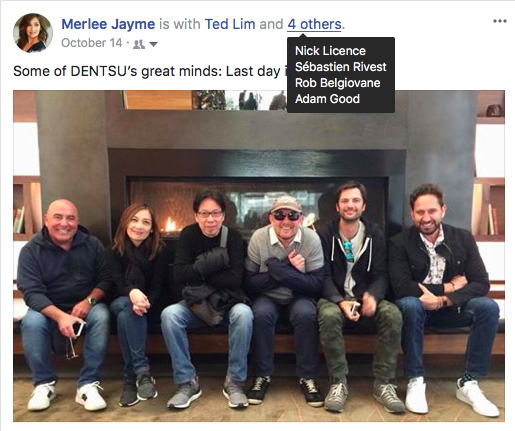 At each event during the year, we bonded and worked up some indeed groundbreaking ideas that demonstrate how Dentsu Aegis Network is in good shape and has the right people to disrupt and innovate the creative industry with an original global offering that is built for the digital economy. We are just at the start of the Craft Matters journey, and 2018 will will see DAN continue to empower our creative communities to evolve our creative process, capabilities, and solutions with the right tools, methods, and partners. I want to personally thank Jean and my fellow class members for there passion, the individual contributions everyone made to Craft Matters by the DAN community made it a pure delight to be part of it. Here’s the Class of 2017! As mentioned in a previous blog Uniqlo a Japanese casual wear designer, manufacturer and retailer takes customer experience both in the real world and digital channels very seriously. In planning and designing all aspects related to its store experiences, the company adopts the Japanese concept of kaizen, which translates to mean a continuous search for perfection and is now beefing up e-commerce operations by carefully repositioning itself to appeal to a wider, more multicultural set of consumers but without losing its ‘Japanese-ness’ – a quality that can be glimpsed as much in the technologically hip way it communicates with shoppers, as in the discipline of its clothing designs. Heattech tops and UltraLight down jackets are two of Uniqlo’s big sellers, items that represent the brand’s style of simple but highly functional clothes. And now they’ll be sold in one of retail’s simplest and most functional of venues: vending machines. Vending machines are cheaper to operate than physical stores and are a convenient way of selling basic, travel-friendly clothes to harried consumers. The first Uniqlo To Go machine goes live this month and Uniqlo will roll out nine more of the machines at airports and shopping malls around the US, this month. The machines have a variety of colors and styles for women and men, changing with the seasons and local customer needs, and dispensed upon purchase in small boxes or canisters. The airport locations are especially fitting for the brand’s signature thermals and jackets, which are designed to be thin but warm and easily packable. The Go World TV campaign idea was developed at TBWAChiatDay in 2008 by worldwide creative director Lee Clow, executive creative director Rob Schwartz, creative director Patrick O’Neill, art director Becca Morton, copywriter Gage Clegg, agency producers Richard O’Neill and Rob Saxon. “Go World” idea is to evoke the emotion and memories of unforgettable moments in Olympic history. The TV campaign features heroic tales of Olympic legends and showcases amazing feats of human spirit. Go World campaign debuted in the United States leading up to the Beijing 2008 Olympic Games. Since 2008 Go World has become Visa’s global Olympic-themed marketing campaign idea and in 2009 ahead of the Vancouver 2010 Olympic and Paralympic Winter Games further extensions were developed. More than 300 financial institution clients and merchant partners in 20 markets have participated in Visa’s two past Go World Olympic marketing campaigns to generate business and excitement among their customers. London 2012 Olympics will mark Visa’s 25th anniversary as a sponsor of the Olympic Games and member of the IOC’s TOP (The Olympic Partner) Program and once again Go World will be used as the sponsorship platform for Visa to introduce new and innovative ways to engage with cardholders, drive usage of Visa-branded products and increase brand equity. The London Olympics in 2012 will be very different as a sponsor as it will be the most digital consumed Olympics ever. London’s global event will feature the most amount of digital platforms and channels used and the most amount of social media excitement ever created. Showing a television campaign will not be enough. Mobile channels are growing in time spent and application consumer use. The Visa brand in mobile channels has the opportunity to be focussed on being useful first to users and conversational and social next. What was interesting in February 2012 Visa and Samsung got together and revealed their official useful mobile payments application for the London Olympics. What was unique about this partnership was it got two Olympic sponsors together to focus on developing a digital consumer experience for the Olympics rather than just shouting out Olympics sponsorship messages in digital channels. The Visa Olympic mobile application is structured on Visa’s payWave technology that enables contactless payments at the Point of Sale. Backed by the multi-layered security and reliability of Visa’s processing platform, mobile contactless payments are protected by the same standard terms and conditions that apply to the Visa cards. Olympics in London offers a wonderful business-building opportunity for Visa to extend the Go World platform and build out a digital platform to allow the world to stand up and cheer as one global community. When thinking about using social media for Go World in 2012, Visa Inc were unsure how the TV centric idea could be translated into digital channels so they went to pitch in April 2011 asking their current digital agencies in North America TBWA, OMD, AKQA plus the addition of Proximity Worldwide to pitch for the digital account. I was lucky enough to be chosen to lead the global pitch for Proximity and over a six month engagement we attempted to push the boundaries of the Go World idea using our talented network of creative thinkers. One killer idea we conceived was called ‘Go Together’. It was an idea of creating a digital community using a relay baton that linked to the Internet. Our created device was to be deployed in every country around the world. Some 175 of these batons were to be created using exciting new features from the up an coming Samsung Galaxy smartphone. When this interactive enabled Visa baton was found at Visa merchant outlets and promoted Athlete sponsored events it could be interacted with by the public using either voice, photos, and video. The call to action or value exchange of the Visa baton was to cheer on their country athletes and pass their personal message along both physically and digitally. There efforts were rewards in a social media race to the Olympics as entries gave people a chance to win a trip to London for their participation. The network enabled baton device had an in built microphone and camera to capture cheers and sent to a Visa cloud that could be stored as video and pictures that would be later broadcasted in London during special Visa outdoor events. People had this exciting chance through their captured digital footprint to be in London delivering their very own country six second cheer stored as digital currency by Visa. It was a big idea powered by two Olympics powerhouse brands in Visa and Samsung. I was excited. While it was great that Visa Inc awarded Proximity Worldwide the global digital and social media agency of record for our pitch efforts and our thinking. After winning the digital agency of record pitch the idea started to lose momentum as we collaborated with the large group of agency on the roster. Don’t you just love modern integration. In the end what disappointing the ‘Go together’ idea fell away. Proximity was instead to park this innovation lead and work to a TV centric idea from TBWA and media partner OMD. Digital was to just extend a TVC idea and support this via a Facebook page. I could say a lot at this point but the only thing you can say is the ability to be brave and innovative is not for every client. Visa was not going to be famous at this Olympics at any event. So the digital implementation of the Facebook page to extend the TVC was handed to our Atmosphere Proximity New York office to implement and work along side the technology social media enterprise software from Buddy Media. The Go World social media Facebook platform’s plan was to connect the Visa Olympic sponsored athletes with global fans using embedded video served from YouTube and linked into Facebook walls. The social media campaign attempts to create a campaign framework that regions can customize Go World content for their local markets. The Go World digital program also integrates local relevant merchant offers in both the physical and virtual environments with a business objective to connect with consumers at the point of transaction. The London 2012 Go World campaign will launch in April 2012 and gradually extend over 35 countries following the Olympic coverage till October 2012. The Go World 2012 ‘Cheer as one’ campaign will be led via television spots and have some supporting digital and out-of-home advertising, usage promotions and various other local market extensions. The stories of Team Visa athletes and Olympic legends will also be featured prominently throughout the Olympics coverage celebrating athleticism and human triumph. While I can’t say I think the Go World cheer Facebook idea is anything special, it has been the longest running pitch and process I have ever been involved in to create I thought it deserved a blog post to remember the time. So good luck cheering as one everyone and to Visa Inc/TBWA/Proximity/OMD in maintaining a Facebook like page throughout the Olympics. Maybe a little easier. As for me I will be looking for something much more innovative and exciting in building brands and creating customer experiences. The management of a Facebook brand page is very 2011. The Digital Lab is a global digital thought leadership and strategic innovation practice powered by BBDO and Proximity. The Digital Lab’s mission is to continually raise and maintain the “Digital IQ” of BBDO’s staffers and clients by providing timely, relevant and actionable thought leadership, strategic analysis and venture development services connected to the most disruptive emerging media platforms and innovations across the globe. For this year’s SXSW event Barefoot Proximity in Cincinnati wanted to provide an exclusive coverage streamed to Digital Labs. Basically Proximity is sending a proxy for you to SXSW Interactive in Austin so you can experience the most popular interactive conference in the world from home or work. As well as this a few lucky people will be chosen to remotely control the Proxybot via Twitter. They’ll decide which sessions and which parties to attend. Hundreds of Tucson area school children will get a chance to let their lessons take flight and their imaginations soar over the next month as they participate in the Great Paper Airplane Project through an innovative competition developed by BBDO San Francisco for the the Pima Air & Space Museum. The Pima Air & Space Museum is one of the largest aviation Museums in the world, and the largest non-government funded aviation Museum in the United States. The Museum, which opened in 1976, maintains a collection of more than 300 aircraft and spacecraft from around the globe, including many rare and one-of-a-kind, and more than 125,000 artifacts. At the end of a month of paper airplane construction and practice sessions, the first 300 children between the ages of 6 and 14 who sign up on the www.GreatPaperAirplane.org website will be eligible to compete to see whose paper airplane can fly the furthest. The competition begins at 11 a.m., Saturday, January 14, 2012, at the Pima Air and Space Museum, 6000 E. Valencia Rd. The young paper airplane flier whose plane flies the furthest will win a spot as Guest Engineer on the team challenging the Guinness Book of World Record’s largest paper airplane honors. This massive paper airplane – with the young Guest Engineer’s name on the tail or nose — will eventually soar from a height of 5,000 feet over the Arizona desert. It may fly for miles or crash and burn, but that’s all part of the fun of scientific experimentation. Strewn across beaches, it’s ugly as sin. Gathered up and presented on a billboard, it cleans up quite nicely. BBDO San Francisco this month constructed a billboard on Venice Beach made from almost 18,000 pieces of beach trash—as a teaser advertisement for One Beach, a film about beach conservation, sponsored by Barefoot Wine & Bubbly. The client has worked for more than 15 years to support clean and sustainable beaches—ones that are “barefoot friendly.” One Beach, directed by Jason Baffa, looks at how creative innovators are cleaning beaches and changing the world. Last month, BBDO San Francisco and Comcast got together to create “Help the Giants Win” which asked fans over social media what rituals they took part in that led to last year’s World Series win. Now, the two are getting a little more personal, trying to decide what fans decided to go past third base to celebrate the Giants successful season . The “World Championship Baby” contest in an attempt to determine what San Francisco baby is born closest to 7:54 p.m. PST on August 1, the official nine-month anniversary of the World Series. Over 900 expecting parents who presumably got past third base that fateful evening have signed up via digital channels. At 8:02 pm on that day, CSN have said hello to its Champion munchkin, Brooklynn Olivia Bird. Just for arriving at the proper time, Bird has received a birth certificate signed by the Giants team, a commemorative brick paver at AT&T Park and a $2,010 gift card. The initiative was the kick off for BBDO SF’s new campaign for CSN, which is based on the theme of “Let’s repeat last year.” The idea being: CSN can bring you another winning championship season.